Each shaft is 12.75mm Tip Diameter, OB-1 Special Pro Taper, Talisman Pro Medium layered at no additional charge. You can make special requests. Owen-Bunnell, Inc. warrants OB-1 Cue Shafts to be free of defects in material and workmanship for the life of the product provided it is not abused or misused and also provided the carbon fiber ferrule cap is in place. Owen-Bunnell, Inc. does not warrant materials and workmanship provided by others, such as joint installation or repair or tip replacement. If the purchaser notifies Owen-Bunnell, Inc. of any failure to conform to the warranty and delivers the failed cue shaft to Owen-Bunnell, Inc. freight prepaid, Owen-Bunnell, Inc. will repair or replace, at our option, the failed shaft. Owen-Bunnell, Inc. will return the repaired or replaced shaft to the purchaser freight collect. This is the sole warranty of Owen-Bunnell, Inc. pertaining to OB-1 Cue Shafts and no other warranty is applicable either expressed or implied, in fact or by law. 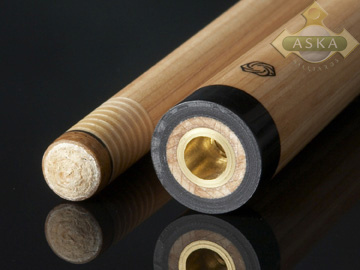 The purchaser’s only remedy in regard to any failed OB-1 Cue Shaft shall be the repair or replacement of that shaft. Owen-Bunnell, Inc. shall not be liable for any consequential, special, incidental or punitive damages resulting from or caused by any failed Owen-Bunnell product.